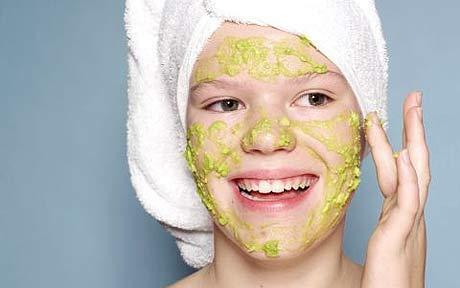 How to prepare herbal face pack in home? A facial pack is an intensive healing treatment that makes use of moist heat to remove deep-seated impurities. Face packs help reduce wrinkles, pimples, dark circles and acne. Using the right face pack that suits the skin type makes the skin fairer, cleaner and much smoother. Packs improve circulation and keep the skin firm and taut. If you have pimples, blackheads or boils, a purifying facial pack may be just what you need. Even if you don’t have any unsightly blemishes, a facial pack will provide moisture to dehydrated skin (oily skin can get dehydrated, too). An ayurvedic face pack which absorbs the excess oil secretions of the skin. Ingredients of natural face packs consist of fresh fruits and vegetables that nourish the skin and greatly enhance natural beauty; enzymes contained in them tone the skin and provide the necessary nutrition. For preparing home mud pack, take a spoonful of Fullers earth (multni mitti) , two teaspoons of rose water , tomato juice , mix well and apply all over face and neck , Then leave on for 15 to 20 minutes and wash or wipe with cold water or rose water . Fullers earth tightens and tomato helps tone the skin. This face pack refreshes and rejuvenates the skin. It is best suited for oily skin . Collect 2 slices of banana , 1 slice of apple ,1 tsp of honey , 1 piece of orange , 1 piece of peach, 2 pieces of strawberries and raspberries With a blender or mixer take a bunch of rose petals and blend mix in mask mixture. Now mix everything together and apply on the face and leave on for 30 mins. Then wash with fresh cold water. This is best rejuvenation, freshing face pack. Mix in shudda guggula with milk, apply over face and neck and wash after ten minutes. This is a great pack for skin purification, rejuvenation, blemishes and other skin related problems. This face Pack exfoliates and tightens the skin. Use for clear even toned skin. Collect 1 egg white , 1/2 finely ground apple , 2 tablespoon brown sugar , 1 tablespoon honey , 1 cup dry oats mix all together and warm slightly before applying to face. Leave for 15 mins then rinse off with cold water. dr sap nepalima question sodhna sakinchha hajurlai?